HB 016 is a block thermostat designed for heating up to 180°C. The unit is microprocessor controlled and so high accuracy of the regulation of the temperature is achieved. The block itself is made from duralumin. In its lower part a powerful heating is placed, which ensures rapid heating to the preset temperature and also a very good homogeneity of temperature (±0.5°C). The unit is equipped with a safety protection against overheating. Synoptic keypad with digital display allows easy adjustment of temperature and heating time. The device memory can store two values of temperature and heating time up to 99 hours in steps of 1 minute. On request it is possible to produce different combinations of diameters and number of positions instead of standard tube drilling diameter of 30 mm, depth 75 mm and a total of 16 positions. With regard to the adjustable part we can for example offer drilling diameter of 16 mm for 60 positions, drilling depth max. 75 mm. 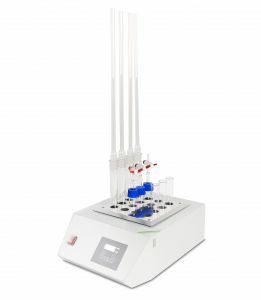 This device is used for example for hydrolysis, oxidative hydrolysis, COD, BOD, sample preparation for amino acid analyzer and other methods. For each method we supply appropriate tubes. On request, the device can be equipped with an external calibration sensor for user-friendly calibration temperature in the tube.